When David Oyelowo, leading actor in this film, producer and the force behind the movie, spoke to our audience after screening this movie, he acknowledged that until he read the book by Susan Williams, he knew very little about the history of the small African nation now known as Botswana. But fortunately, the star of the recent hit Selma and many other excellent movies was personally moved enough to put six years of sweat and tears in order to bring one of the great love stories of the 20th century and the most inspiring story of the birth of this small African democracy, to the 21st century movie screen. 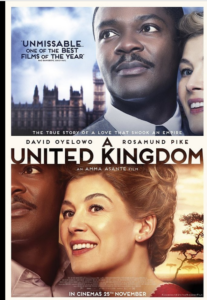 It was 1947 when Seretse Khama (David Oyelowo) born of royal blood and destined to be king of a small African country, was studying in England when he fell in love with a young British white woman, Ruth Williams (Rosamund Pike). Their exuberant love for each other is exciting and quite palpable. Perhaps most of us today would say and feel “Why not?” But, there is great resistance from Seretse’s uncle, the reigning ruler, the neighboring apartheid South Africa and the British Colonial government. 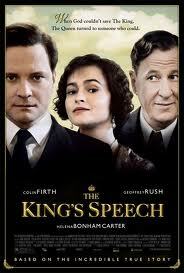 In fact, any respect that you might have for the late Winston Churchill may go down the drain after seeing this movie.